This NASA graphic depicts the ground track of the July 11, 2010 solar eclipse, which will only be visible from the South Pacific. Full Story. A total solar eclipse on July 11 has the potential to give someground-based observers a stunning five-minute celestial show, but you'd almosthave to go to ends of the Earth to try and see it. Solar eclipses occur when the moon gets between the sun andEarth, blotting out some or all of the sun. 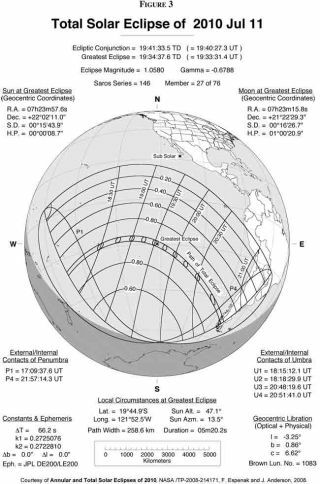 While the moon's dark cone of shadow (called the umbra) willpass more than one-third of the way around the Earth during this solareclipse, virtually the entire ground track for the event falls over the remoteopen ocean waters of the South Pacific. Land encounters will be very few andgenerally far between. For astronomers, total solareclipses provide an opportunity to observe the pearly white corona, orouter atmosphere, of the sun. They occur when the moon comes between the Earthand the sun, completely obscuring the sun from our persepective. The corona's brightness is only about one-millionth asbright as sunlight, but when the moon completely obscures the visibledisk of the sun the corona shines out in magnificent splendor. On July 11, the moon's shadow will touch down at localsunrise about 870 miles (1,400 km) northeast of the North Island of New Zealandand only three minutes later will sail through the Cook Islands, narrowlymissing the most populated (Rarotunga), but passing over the second largest(Mangaia). Weather permitting, it should afford the 1,900 who live there a 3-minute,18-second view of a totally eclipsed sun.? After another 10 minutes, the umbra will glideeast-northeast past the Society Islands, barely missing the island of Tahiti bya mere 15 miles (25 km). If you are stationed on the south coast of Tahiti Iti,"Little Tahiti," you would see 99.3-percent of the sun's diameter blocked by thenew moon. About five minutes later, the dark lunar shadow will take aroughly 15-minute trek through French Polynesia into the Tuamotu Archipelago ?the largest chain of atolls in the world, spanning an area roughly the size of westernEurope. When the umbra departs the Tuamotus at around 18:48 UT, itwill spend the next 83 minutes traveling 2,000 miles (3,300 km) over the lonelywaters of the South Pacific. At 19:33:31 UT, literally in the middle ofnowhere, the total phase of the eclipse will reach its maximum duration: anexceptionally long 5 minutes, 20 seconds.? However, unless you're on a properly positioned boat oraircraft, this prolonged view of the sun's corona will go unseen. But 35 minutes later, the shadow fortuitously makes a directhit on one of the world's most isolated islands: The legendary Easter Island,known for its many hundreds of monolithic statues of various sizes that wereerected by its native Rapanui people. At Hanga Roa (pop. 3,300) — the main town, harbor andcapital of Easter Island — totality will last 4 minutes. 41 seconds, which isonly 39 seconds shorter than the maximum. Here, totality will take place in theearly-afternoon, with the sun 40 degrees high above the north-northwesthorizon. After departing Easter Island, the Moon's umbra will crossanother 2,300 mi (3,700 km) of open ocean before making its final landfall inPatagonia. It will reach the rockbound coast of Chile, sweeps over the Andesand into Argentina and just before sliding off the Earth's surface (at 20:50UT), passes over? the town of El Calafate, where totality will last 2 minutes,47 seconds, but with the sun only 1 degree above the horizon. A number of tours and expeditions have been organized toview this upcoming eclipse. As one would expect, considering the lunar shadow'sconsiderable interaction with the South Pacific, most of these are on cruiseships. There is an advantage of an eclipse cruise in that theship's mobility can be factored in, allowing for last-minute maneuvers to avoidany possible unsettled weather that might otherwise obscure a view of thedarkened sun. Climate data is carefully scrutinized to determine where the bestpossible weather might be found along the eclipse track.? The best location appears to be near Hao Island in FrenchPolynesia, where typical cloud obscuration values register at around 45 percent.? At Easter Island, this figure increases to 55 to 60 percent,while at Mangaia it jumps to 65 to 70 percent while at El Calafate it registersalmost 80 percent.? As discouraging as some of the figures are, however, keep inmind that in the past there have been cases where places with excellent weatherprospects ended up with clouds while places with poor prospects ended up seeingthe eclipse.? As science fiction writer, Robert Heinlein (1907-1988) oncenoted: "Climate is what you expect, but weather is what you get!" The only guaranteed view of totality would be from a jetaircraft.? One in particular — a Skytraders Airbus A319LR/ACJ — willnot only rendezvous with the moon's shadow, but will actually race it therebyprolonging the duration of totality for approximately 9 and a half minuteswhile flying at an altitude of 40,000 feet.? The person who has mapped out the circumstances for thisunusual flight is Dr. Glenn Schneider, an Astronomer at Arizona'sSteward Observatory, and the Project Instrument Scientist for the Hubble SpaceTelescope's Near Infra-red Camera and Multi-Object Spectrometer.? He is also anumbraphile; literally a "shadow lover", but properly applied,one who is hopelessly addicted to the glory and majesty of total solareclipses. "Those who have basked in the moon's shadow will know what Imean without further explanation," Schneider writes. "Those who have not mayhave difficulty in understanding that umbraphillia is not only an addiction,but an affliction, and a way of life." Schneider is indeed addicted to eclipses.? Joe Rao serves as an instructor and guest lecturer at NewYork's Hayden Planetarium. He writes about astronomy for The New York Times andother publications, and he is also an on-camera meteorologist for News 12Westchester, New York.